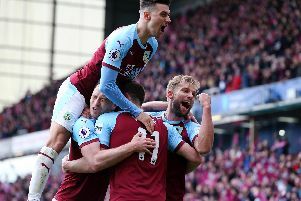 Former Claret John Deary has backed Burnley to stay up. The amiable Scouser believes Sean Dyche’s men are well equipped to stave off the drop this time in the Premier League. And the Vintage Clarets skipper said: “I think they’ve started well. Sean Dyche always sets his team up as tough to beat with a strong defence, and Michael Keane in particular performing really well. I think they will stay in the Premier League comfortably. And Deary believes Keane will be a future England starter, after his first taste of the senior squad for last week’s World Cup qualifiers with Malta and Slovenia: “Michael is on top of his game at the moment and when players are like that, you have to utilise them. I would like to see him start for England as he’s one for the future. “He’s proven he can perform in the Premier League and he’s come in to his own this season, so the next logical step is to play for his national team. “It’s important to stay at Burnley for his development, despite interest from the big clubs. “He’s got a great manager in Sean Dyche and, at a team like Burnley, he’ll have lots of opportunities to deal with defensive situations.